In this issue of the Global Housing Watch newsletter, Jordan Rappaport talks about housing supply—specifically the construction of multifamily, and single-family homes in the United States. 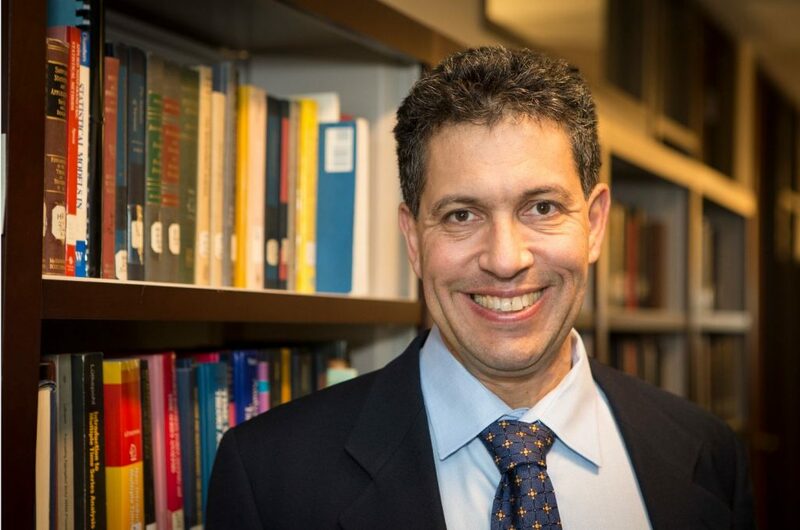 Rappaport is a senior economist at the Federal Reserve Bank of Kansas City. Disclaimer: The views expressed in this Q&A are those of the author, and do not necessarily reflect the views of the Federal Reserve Bank of Kansas City or the Federal Reserve System. Hites Ahir: Since the Great Recession, what has happened to multifamily home construction at the national level? Jordan Rappaport: Construction of multifamily homes, like that of single-family homes, collapsed with the onset of the housing crisis in 2006. Since then, multifamily home construction has surged. Multifamily starts over the most recent six months were up about 10 percent from their mid-2000s peak and, other than a spike in mid-2015, were at their highest level since the mid-1980s. Hites Ahir: How does it compare with single-family home construction? Jordan Rappaport: Single-family construction has also rebounded from its trough. But its level remains very low by historical standards (Figure 1). For example, starts over the most recent six months were about one-third below their level in 2000, just prior to the single-family construction boom. By another measure, the ratio of single-family starts to the number of U.S. households, they are currently at their lowest level since at least 1957, the earliest date for which data are available. 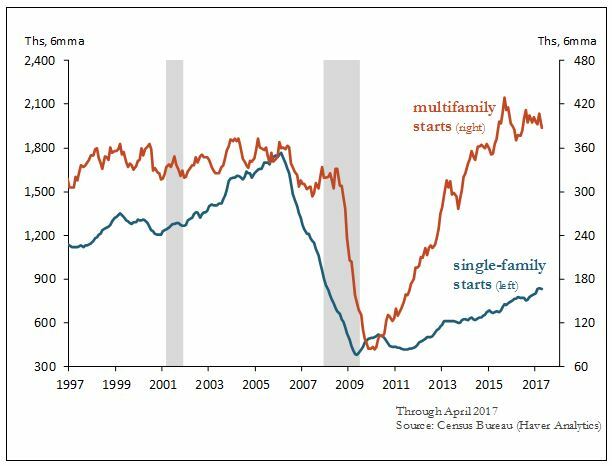 Hites Ahir: So multifamily starts followed a “v” shaped recovery, while single-family starts followed an almost “u” shaped recovery (Figure 1). What explains this divergence? Jordan Rappaport: Both supply and demand components contributed to the difference. With respect to supply, there was a large overhang of unoccupied single-family homes coming out of the Great Recession, due to overbuilding and foreclosures. With respect to demand, there was a large relative shift from single-family to multifamily. Partly this shift reflected households downsizing into rental apartments after losing their house to foreclosure. In addition, as I’ve documented in a previous article, the demand shift partly reflected young adults, ages 25-39, swinging back towards living in apartments following their swing towards living in single-family homes during the housing boom. Hites Ahir: Your new paper is Crowdedness, Centralized Employment, and Multifamily Home Construction. In this paper, you look at multifamily and single-family home construction at the local level—metropolitan areas. What does it show? Jordan Rappaport: As always, there is considerable variation. Both the multifamily and single-family permitting rates during 2013-15, measured as average annual permits of each type divided by the number of housing units of each type in 2010, were close to zero in many metro areas, and quite strong in others (Figure 2). Multifamily permitting was highest in Austin (TX), where it averaged more than 5 percent per year. Four other metros had multifamily permitting rates above 4 percent. Single-family permitting during 2013-15 was by far the highest in Myrtle Beach (SC), not shown in the figure, where permitting during 2013-15 averaged 3.5 percent per year. Five other metros had permitting rates close to 2.5 percent. 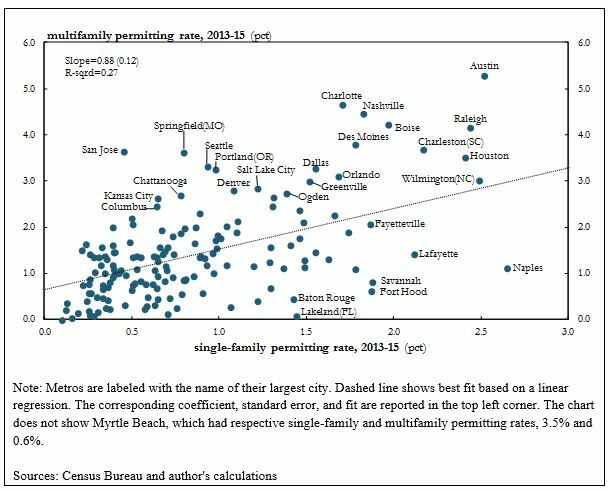 As shown in the figure, multifamily permitting and single-family permitting were positively correlated, primarily reflecting that population growth was the most important factor driving both. Hites Ahir: What are the characteristics that account for the variation in the recent strength of multifamily construction? Jordan Rappaport: Three key characteristics account for a large share of the variation in recent multifamily permitting across metros as well as a large share of the variations in recent single-family permitting, and population growth. Multifamily permitting during 2013-15 was positively correlated with population in 2010, but with relatively small magnitude: a tripling of metro population increases the predicted multifamily permitting rate by about 0.3 percentage point. Multifamily permitting was also related to the internal distribution of population density within metros. Population density varies hugely within metros. Most of the land area in most metros is actually agricultural or unsettled, reflecting that metros are delineated as the combination of entire U.S. counties. Even within the non-rural portion of metros, population density in 2010 across census tracts—geographic units that typically encompass from 1,000 to 8,000 residents—on average varied by multiplicative factor of 60. I capture this variation with three variables. The first is median density, which is the tract density above and below which half a metro’s population live. The second is the increase in population density from the median to the 95th percentile, the density below which 95 percent of a metro’s population live. The third is the increase in population density from the 95th to the 99th percentiles. Multifamily permitting during 2013-15 was negatively correlated with median population density and with the increase in density from the median to the 95th percentile but positively correlated with the increase in density from the 95th to 99th percentiles. The negative correlations with median density and the increase in density from the median to the 95th percentile also hold for single-family permitting during 2013-15 and for population growth from 2010-15. Multifamily permitting, as well as single-family permitting and population growth, was positively correlated with the share of a metro’s employment in 2000 that was located in its central business district (CBD), which I define to encompass the traditional “downtown” of the largest city in the metro as well as nearby census tracts with dense employment. Hites Ahir: What are the underlying forces that may be driving the relationships? Jordan Rappaport: The relationships appear to be picking up differences in metropolitan productivity, consumption amenities, and the availability of land for development. The positive correlations of multifamily permitting with population and the share of employment in the central business district probably reflect, in part, differences in metro productivity. Considerable research has documented a positive relationship between productivity and metro size. Some recent research also finds that a considerable portion of the higher productivity of larger metros reflects the higher productivity of firms located in the CBD itself. Locating in a high-productivity metro can increase profitability, attracting firms and jobs. The resulting competition to find workers bids up wages, attracting workers to the metro. The resulting population growth, in turn, spurs multifamily, and single-family construction. The positive correlation of multifamily permitting with metro size probably also partly reflects differences in consumption amenities, as does the positive correlation of multifamily permitting with the increase in population density from the 95th to the 99th percentiles. Consumption amenities are characteristics that make a metro a more enjoyable place to live. Larger metros typically offer residents a more diverse set of consumption choices such as restaurants, live performance venues, and professional sports teams. In addition, exogenous attributes such as nice weather partly account for why some metros are larger than others. Of course, larger metros also suffer from an important consumption disamenity, worse traffic congestion. Steeper increases in density from the 95th to 99th percentiles constitute population spikes, which often have nearby clusters of urban consumption amenities such as pedestrian access to varied restaurants, cafes, bars, and small retailers. An apparent increase in the preferences of young professionals to live near such urban amenities seems to be driving nearby multifamily construction, primarily by attracting residents from elsewhere in the same metro. The negative correlations of multifamily permitting, single-family permitting, and population growth with median population density and the increase in population density from the median to the 95th percentile probably reflect the role of land available for development, especially within the interior portion of a metro. Higher median density and a larger increase in density within the more settled portion of metro are likely to be positively related to average land prices in the intermediate-distance suburbs and the increase in land prices moving from these intermediate suburbs towards the center of a metro. The higher land prices and associated higher housing prices dampen metro population growth, in turn dampening multifamily, and single-family construction. Hites Ahir: Where single-family and multifamily home construction is strong, are you able to say anything on the strength of multifamily and single-family home construction in the city vs. the suburb? Jordan Rappaport: Several of the correlations hold for both the city and suburban portions of metros. For example, multifamily construction and single-family construction in both the city and suburbs were positively correlated with the CBD employment share. So more centralized employment was related to construction throughout a metro area rather than just near the CBD. Similarly, multifamily and single-family construction in both the city and suburbs were negatively correlated with median metropolitan population density, and with the increase in metropolitan density from the median to the 95th percentile. In contrast, only multifamily permitting in the city portion of metros was positively correlated with the increase in population density from the 95th to 99th percentile, suggesting that the relationship between population spikes and multifamily construction was limited to nearby locations. Hites Ahir: The Large Unmet Demand for Housing—is another article that you just published. How does it relate to the findings in Crowdedness, Centralized Employment, and Multifamily Home Construction? Jordan Rappaport: The article argues that the current low level of single-family construction reflects supply constraints rather than weak demand. The resulting limited availability of new single-family homes for sale is causing many homeowners to remain in their current home rather than upgrade to a newly-constructed one. This depresses the availability of existing single-family homes for sale, causing many other homeowners to stay put, and so further depressing the availability of homes for sale. As a result, the current number of existing single-family homes available for sale relative to the number of U.S. households is at its lowest since at least 1982, the earliest date for which data are available (Figure 3). With so few single-family homes available for sale, many renters are staying put in apartments, pushing the apartment vacancy rate to its lowest in several decades. 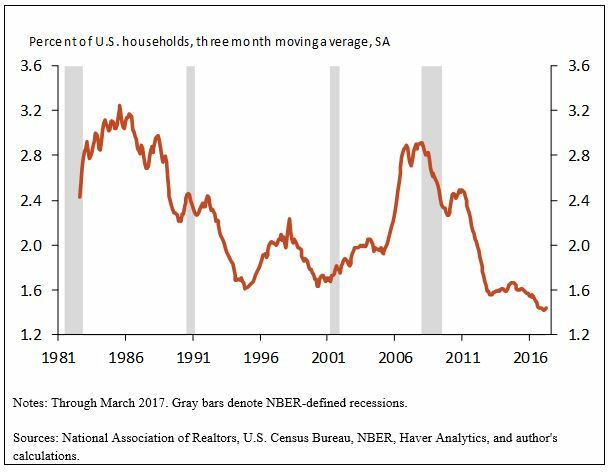 The Census Bureau defines a household as an occupied housing unit, and so with few vacant homes, and apartments to move into, household formation is being significantly depressed. Possible reasons for the current low level of single-family construction include a shortage of construction workers, and limited financing to smaller builders for speculative construction. I also think that in some more crowded metros, suburbanization may have reached its geographic limit. Consistent with this hypothesis, single-family construction in some larger metros has been shifting from the suburban portion to the city portion. Hites Ahir: What are the policy implications of your findings? Jordan Rappaport: One implication is that metropolitan policies that support centralized employment, such as efficient commuting transport links, may help attract firms and residents from elsewhere in the country, and boost population growth and residential construction throughout the metropolitan area. Another implication is that policies that promote urban amenities, whether in the city or suburbs, may attract residents from elsewhere in the metro and, possibly, from other metros, boosting nearby multifamily development. In contrast, policies that seek to encourage multifamily development close to CBDs based on cutting commuting time may prove unsuccessful if they don’t also take into account the sufficiency of nearby urban amenities. Looking forward, the leading edge of the baby boom turns 75 in 2021, the age at which downsizing to multifamily homes typically picks up. Public policy may be able to help shape amenities that appeal to such downsizers—for example, through zoning policies that support the development of neighborhoods that mix multifamily housing, urban amenities, assisted-living arrangements, and proximity to where seniors’ children and grandchildren live. Hites Ahir: In the long run, how is technological innovation likely to affect multifamily home construction? Jordan Rappaport: The development of self-driving cars may dramatically impact metro land use, including boosting multifamily construction, via three channels. First, the availability of inexpensive ride-hailing services employing self-driving cars will probably cause many city residents to forego owning a car, thereby greatly relaxing tenants’ demand for attached parking. Not providing parking significantly cuts the cost of multifamily construction, and frees up land for other uses. Second, relaxed parking demand will similarly free up a large portion of the land in central business districts, thereby facilitating increasingly centralized metropolitan employment, and reinforcing demand for multifamily housing in cities. Third, self-driving cars promise to make time spent commuting more pleasurable and productive, thereby boosting demand for single-family construction in relatively distant suburbs. All three channels decrease the broadly-construed costs of metro size, and so should boost population growth of larger metropolitan areas relative to smaller ones. Hites Ahir: In the future, do you think that we are likely to see less single-family home construction in the cities? Jordan Rappaport: In some cities, single-family construction is already extremely low. For example, it accounted for less than 2 percent of housing permits during 2013-15 in municipal Boston and municipal San Francisco. But in many other large cities, single-family construction remains significant. For example it accounted for about 30 percent of housing permits in municipal Houston and 20 percent of housing units in municipal Philadelphia. Especially high land prices in Boston and San Francisco, probably driven by their especially high urban amenities, may account for much of the difference. The increased attraction of urban amenities may drive up the price of land the city portion of a number of other metros, crowding out single-family construction.